Donna’s nature journals is a photo collection of the nature journals I have kept for many years. There is something about making a book. Particularly an illustrated book that really excites me. maybe it is because of the illustrated books I read as a children. I still love to pour over the illustrations in English children’s books like Winnie-the-Pooh, the Beatrix potter books, the Brambly Hedge series and many more. Learning about studying children’s literature in library school was so enjoyable. When I moved to teaching high school students, I missed the constant exposure to the best children books illustrations. and John Muir Laws’ two books: Laws Guide to Drawing Birds and Laws Guide to Nature Drawing and Journaling. I like just looking over these books and getting ideals. Both books are full of ideas for homeschoolers. As I wrote earlier this spring, the last year has been a world wind of activity and I haven’t drawn in my nature journal as much as I used. But creating this post has reminded me just how beautiful and enjoyable nature drawing and journaling has been for me. I want to draw more this year. Drawing helps me to understand how something is put together and how it works. I have made a commitment to nature journal regularly each week. I’ll post some of my pages as I have this spring. 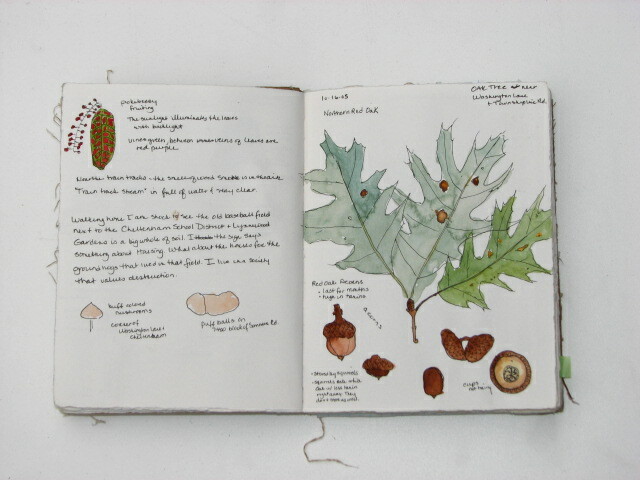 I hope these pages inspire you to start nature drawing and journaling if you haven’t already. I have many pages on this site about how to get started. Nature Journal – What is It and How Do I Start? Thanks for your blog. Just wanted to let you know that I’ve been using your posts on nature journaling in the Writing as a Naturalist class I teach at Rutgers. They’ve been very helpful as encouraging examples and an excellent resource of information on strategies and systems. Thank you, so much Donald. This really warms my heart. I am a Rutgers grad, 1989, Master of Library Science. Rutgers is an excellent school. I would love to take your class! I love your journal pages! I was just shown the Grinnel Journal Method and I’m going to try it. I want better journal pages, not just lists. Thanks, Lynda. We would love to see the journal pages you do.